California’s newly regulated marijuana market is the biggest in the world, but not everyone seeking to do business there can acquire the tools to even break in, let alone succeed. Many cannabis business owners are encountering a lack of funding opportunities, curbing their ability to thrive and forcing some to operate in the illicit market, according to several industry sources. After California became the first state to legalize medical marijuana in 1996, the industry developed with homegrown businesses – meaning the vast majority of companies were startups with little seed money or overhead. But that changed in January with the rollout of a new regulatory system that is actively squeezing out thousands of longstanding legacy MMJ businesses. The rules are making it harder for new companies to find their financial footing, because entrepreneurs must often pay hundreds of thousands of dollars to secure licenses and comply with regulations covering everything from product potency and packaging to zoning. “Since all of the regulations went into place, now it takes a few hundred thousand to a few million to start,” said Kimberly Cargile, CEO of Sacramento retailer A Therapeutic Alternative. Get out or break the law? The problem is perhaps most acute for legacy companies that would like – but are unable – to take part in the fully legal market. Many are either already located in cities or counties that have banned cannabis commerce or have just a limited number of business licenses. The choice is either to quit the industry altogether, pivot to the illegal market and risk possible criminal penalties, or relocate to a jurisdiction that’s granting permits. How many legacy operators are facing such a decision? “Sadly, it’s probably in the thousands,” said Morgan Paxhia, co-founder of Poseidon Asset Management in San Francisco. “What we hear about all the time – which is the opposite of what was intended with legalization – is a mass defection to the black market,” Paxhia added. One grower in Calaveras County, northeast of San Francisco, said his family sunk more than $200,000 into getting local and state licenses before the county decided in early 2018 to ban all cannabis cultivation. And now, because he can’t afford to pick up and move his operation to a county that will give him a permit, he’s almost certainly going to start selling illegally. The grower said he’s inquired about financing and found that his small-scale operation doesn’t produce enough volume to get the attention of anyone who can offer the several hundred thousand dollars he needs to build out a new farm. “They want you to be holding several half-acre or 1-acre permits and licenses to even think about investing,” he said. “Most of the bigger guys, a half-acre grow isn’t going to make them the kind of money they want to make. Another entrepreneur in the San Francisco Bay Area has been trying for months to get her 5-year-old MMJ delivery business licensed, to no avail. She’s also investigated moving, but that appears cost-prohibitive. “It would definitely be a problem for us. We figure easily $500,000,” said the businesswoman, who also asked for anonymity. Part of the problem, she added, is most local jurisdictions want business license applicants to already have physical locations lined up before even applying – meaning she’d have to shell out for a location before even knowing if she’d be granted a business permit. Unlicensed businesses aren’t the only ones struggling to find cash to help stay afloat. “We put a lot of money in on our own, and we started crowdsourcing … but up until now, it has been really hard to find an investor for one lump sum, or even a portion of it,” said Ella Alpina, co-founder of Thrive Society, a distribution company in Nevada City. Although her company has already landed a distribution license from the state, her company’s problem is that it’s a startup, and therefore has no track record to attract investment. 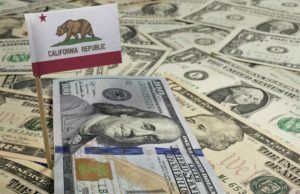 Even if startups can attract investors, the deals put on the table can often be heavily weighted in the investor’s favor, said Ariana Tibbets, co-founder of Gold Mountain, a distributor based in West Sacramento. A lack of local licensing across the state for legacy companies, combined with the high cost of complying with regulations and lack of access to financing, is leading to one thing: Major market consolidation. “The general trend is, taxes are too high, regulations are too onerous, and as a result, you’re seeing mass consolidation. I wouldn’t be surprised if this massive market is controlled by about 20 groups that will have significant market share in the next two years,” he said. Those market leaders will likely corner 80% of the California cannabis market, leaving the other 20% for small operators to fight over, he predicted. Loans up to 85% LTV on Cannabis Real Estate starting at 7% interest. Other money available as well. Lots of new money on the table these days. Kevin – who are these lenders? I would love to reach out to them. I have a business partner that has Cannabis Real Estate lending options. I’ve heard a company called Glacial Funding will do all types of cannabis financing deals. Glacial does NOT do any kind of cannabis lending… The guy is out there, you might want to strike this comment to save others the grief. We need MJ lenders that can actually deliver. Clients we are speaking with need energy generation equipment and build-out capital. We have 4 active files totaling 28MM and no realistic lenders. Why isn’t California offering some sort of small business loan program to these companies? Has the state already made up their mind to allow big cannabis to take control and allow the folks who started it all to go down the drain? Yep. That idea was was very likely at the very center of the state’s blueprint on how this whole thing was going to go down. It seems as if they ( the state ) and and some cannabis associations then took all these small farmers on a joy ride ( and they’re still doing it ) of hope and promise to distract them from what was really going on behind closed doors, and to keep them from more effectively fighting back until all was said and done ( the “laws’ ” passage ). So yes, their mind was made up a looong time ago; unbeknownst to many of us. As you stated, the small farmers/operator’s were forcefully flushed down the drain, into the sewage pipes, discharged out into the bay, to be eaten by Great Whites, and then *** out to where we now have an over population of ( but really happy ) sea urchins. This entire mess is avoidable. Let the Free Market handle the situation. Before the fake legalization folks all over the world conducted the pot business without conflict, crime or governments. Our hemp growing forefathers founded a nation based on just ‘plant it everywhere’. George Washington. the cost of business to run a small mom and pop shop is way to high and counties changed rules like lake county where you must have 20 acres to grow And allows grape farms to use land not suitable for grapes puts us out of business. If your income was under 150k there is no way you can stay in business. Just the licensing and taxes are more than your income. The worst culprit in that scenario for manufacturers, distributors, and dispensaries is the cost of the rent/lease for your building space. In order to get a license you have to already have a space. (in a green zone with owner consent). Which means you have to be paying for that rent/lease space before you even get the license. And that can be quite the financial burden one has to bear for an unknown time frame until they get their hands on a license to operate (building and fire dept sign-off) . . …And investors only want to invest in somebody who has a license that is active. Unfortunately Cultivators cannot pack up and move. Which means only the ultra large investment firms can handle the cash burn until dollar $1 in their new facilities. These ultra large firms are also not the small people who bought random land in the middle of nowhere HOPING to cultivate legally. Ultra large cultivators strategically chose areas that were not going to be shut down. They also lobbied and paid off the right people to ensure the city councils did not randomly change their mind. Nobody wants to invest millions and find out the city council decided not to permit your operation. And smaller cultivators chose land willy nilly style without regards to what counties will allow operations and which will not. And then we have Co-Ops . . If you are a co-op, you’re screwed unless you can make the switch to a micro-business in an area that will permit you. Ultimately co-ops are going away. Why do you think coops are going away? It’s a catch-22, if you are in an unregulated market then your amazing cannabis idea can’t meet a proof of concept because you would be arrested if you tried selling. And it takes the investment you can’t get without proof of concept to set up in a regulated market and become licensed. Oh vey! 215 was a much better law than the current oligopoly scheme which screws the little guy.. with 85% of the state banning pot the black market is alive and well.. Your right, The black market (your words) has never had such a wide spread promotional campaign since the BCC took control. I understand the black market is going to set up their own association and promotional campaign. I see it now, “SAME PRODUCT HALF PRICE WITH DOOR TO DOOR SERVICE” That’s great for the consumer, free enterprise at work. But I’m worried about the intercity teenage teens of color that start shooting each other again over a street corner spot because our BCC is making rules not for the industry, but rather the new cannabis world of back room BCC dealer makers. Time for a public initiative mulligan, this time with much better language to protect us from the current thieves AKA the BCC, we know we have the votes! well, duh it has always been about crowding out small existing and startups. the big money guys didn’t even have to do anything but sit and wait out the chaos an ignorant and greedy government brings to the licensing table. knowing govs, it was no surprise that early on they admitted they knew nothing of the business and needed industry input. the small guys had a glimmer of hope but it was soon obvious that the 50 pages of regulations were designed to make way for big investors only. not many really interested in the medical or other healing aspects and wanting to do it legally could afford compliance and the several 100ks, so they have to stay underground or quit. nothing new here or in dc currently for that matter, greed and special interests trump, pun intended. Mike, that 50 pages of regs is really 268 pages. hi george i abandoned any interest in wanting to participate in a legal business focusing on the medical aspects that many of my peers (geezers) would benefit from when i downloaded and read 58 pages. i have experience with multi million dollar public works projects and it looks like the gov is forcing out any other than those that have the wherewithal to bid and comply with overbearing gov regs at that level. but what is new, the little guys never had a chance.